IIn readiness for Munich/High-End Show, Sorane General brochure (“8 pages”) is now available. 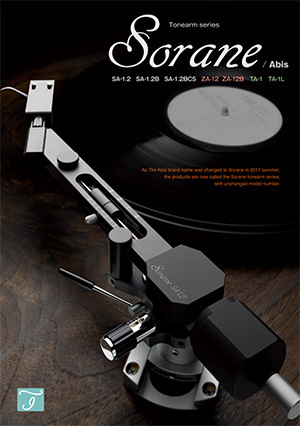 What we would like you to note in this new brochure is “SA-1.2 BCS” tonearm, which enables you to enjoy sound difference between “Positive Balance” and “Negative Balance” (Each terminology is explained in detail in this brochure) in counter-weight shaft height, available in the same tonearm. There is no other tonearm in the world to get you this exciting phenomena. Another big topic in this brochure is “Sorane/ZA-12” tonearm (Commercially available in this autumn), as 12” version of world renown SA-1.2 standard tonearm, equipped with non-detachable type head shell and also, extremely low distortion geometry design just between Lofgren and Stevenson distortion curve, along stylus movement throughout vinyl record outer- to inner edge. HANA/Sorane/Planalogue combi. will be demonstrated in UK.